Our pre-Mayday Maypole. Dance to plait ribbons in the tradition for visitors & kids on Sat & Sun. 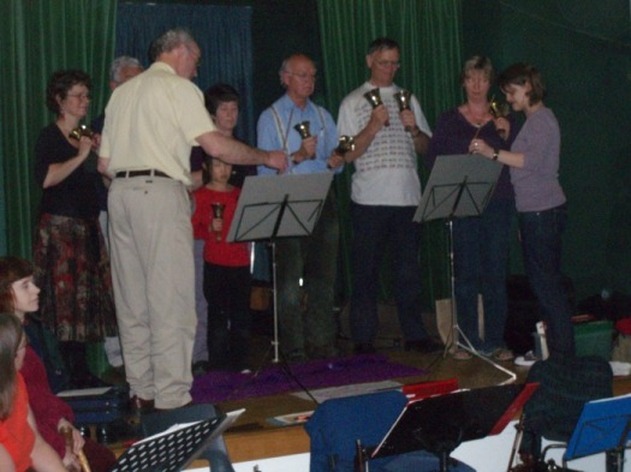 Handbells **** Part Song **** Walking **** Cycling **** Family trees **** Ham Radio Station **** Chez Meg 4tea & scones. Ringing Paul's handbell tunes is popular with children, senior citizens, and all "between". Pic. A short evening entertainment spot by a few from the daytime workshop. Particularly lovely walking country surrounds Great Alne. usually. In cooler late Springtimes; instead the white carpet of the earlier Wood Anemones. 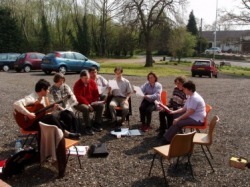 Copyright; Tony Heaton 2004. PIC. 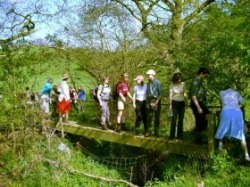 The group walking nearby encounter a challenging feature en route. Do bring along your bike for Sunday afternoon. To partake of this delight, ensure John Tozer has YOUR name "on the list" & your £1.